Evil and Suffering... Is there a God? Once a cutomer went to barber to get a haircut. During the haircut he began to converse with the barber and he said, 'you know what.. i dont believe in God. If there was a God then why is there so much evil and suffering and poverty around the world, there cannot be a God!' The Barber decided it was best not to reply and so continued with the haricut. After it was finished, the customer paid the Barber and left the Salon. Similarly, just because there is poverty and suffering around the world doesn't mean that God doesn't exist, if they don't turn to Him then how do they expect God to help them? There is a huge need for us to get involved in charity work in this day and age. 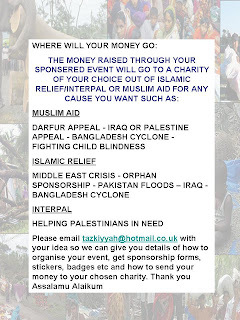 I came across this poster i was emailed about getting sponsered4charity which is basically encouraging us to get sponsered for charity to help our brothers and sisters around the world. This is very important especially after recent natural hazards such as the Bangladesh Cyclone and the Indonesian Landslide. 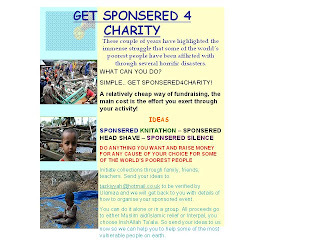 So please brothers and sisters, get sponsered for charity in your community and get involved! Long ago in the city of Baghdad, there was a Muslim empire. On one side of the River Tigris were the royal palaces and on the other side was the city. The Muslims were gathered in the Royal Palace when an athiest approached them. He said to them, ' I don't believe in God, there cannot be a God, you cannot hear Him or see Him, you're wasting your time! Bring me your best debator and I will debate this issue with him.' 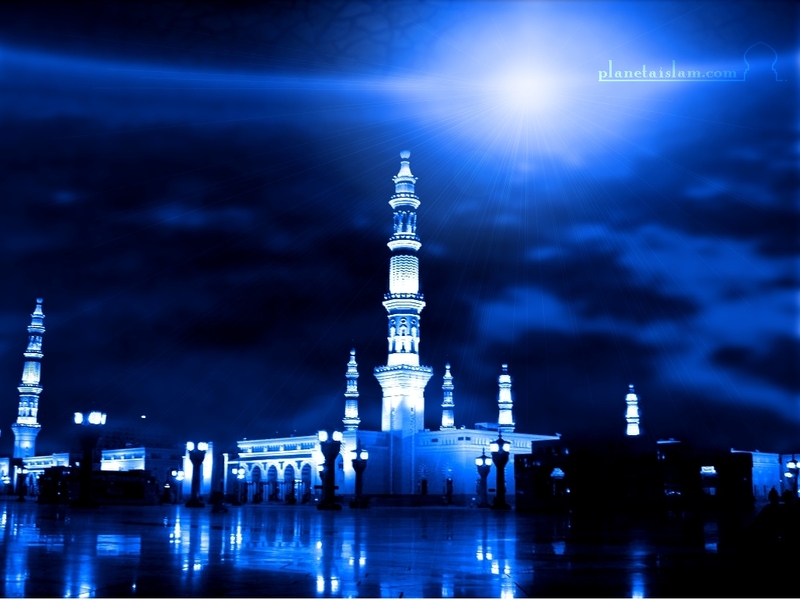 The best debator at the time was Abu Hanifah Rahimullah. A messenger from amongst the Muslims was sent over the River Tigris to the city, where Abu Hanifah Rahimullah was, in order to tell him about the athiest who was awaiting him. On crossing the River Tigris, the messenger conveyed the message to Abu Hanifah Rahimullah saying, ' Oh Abu Hanifah, an athiest is waiting for you, to debate you, please come!' Abu Hanifah Rahimullah told the messeneger that he would be on his way. 'Once the messenger delivered the message to me, I began to make my way to the River Tigris, and on reaching the river bank I realised there was no boat, in order to cross the river. It was getting dark, and I looked around, there was no boat anywhere nor was there a navigator or a sailor in order for me to cross the river to get to the Royal Palaces. I continued to look around for a boat, as I did not want the athiest to think I was running away and did not want to debate with him. I was standing on the river bank looking for a navigator or a boat when something caught my attention in the middle of the river. I looked forward, and to my amazement I saw planks of wood rising to the surface from the sea bed. I was shocked, amazed, I couldn't believe what I saw seeing. Ready made planks of wood were rising up to the surface and joining together. They were all the same width and length, I was astounded at what I saw. Abu Hanifah Rahimullah replied, 'If you cannot believe that a boat came without a boat maker, than this is only a boat, how can you belive that the whole world, the universe, the stars, the oceans, and the planets came without a creator? The athiest astonished at his reply got up and fled. 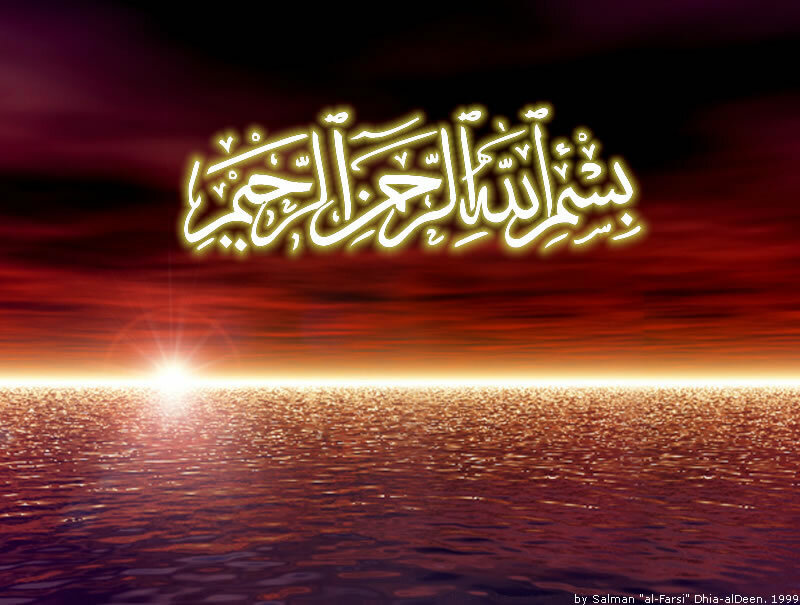 In the Name of Allah, The Beneficent, The Merciful All Praise is to Allah, The Lord of the Worlds and Blessings upon His beloved Prophet peace be upon him.